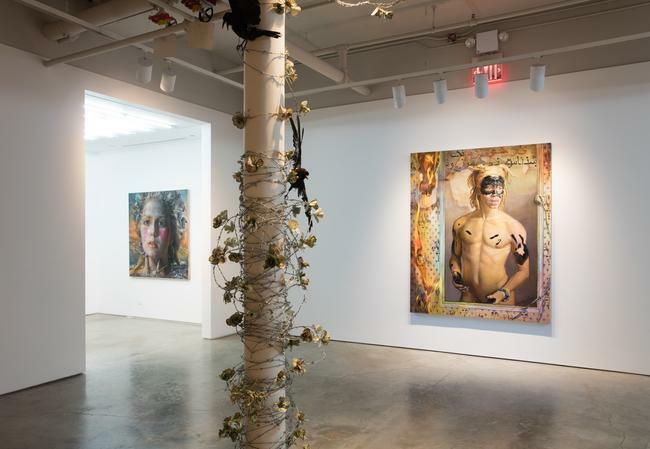 Bowland’s paintings construct an anachronistic world dense with symbolic imagery. She employs a variety of sources, from the artistic production of the early modern Deccan plateau of India, to post-Renaissance European paintings, to today’s fashion magazine spreads. In this maelstrom of references, Bowland’s subjects bear the weight of complex power struggles, reckoning with enduring issues of race, gender and agency. Yet it is who Bowland chooses to surround with these status symbols that reveals her true interests. In the diptych TANGLED UP IN BLUE, a man and his young son, both dressed in suits, occupy a Park Avenue apartment with stately wainscoting and moldings. Behind the man is a resplendent halo of gold lines, directly referencing the power marks which would appear in the sultan’s portrait in 17th century Deccan Indian miniature paintings. Covered in blue paint, his hands dirtied, while his son remains just out of reach of the cascading drops of paint, it becomes a meaningful meditation on the sacrifices of parenthood. In this way, Bowland raises issues with the historical complexities of power: who has held it, who has fought over it, and who she chooses to privilege with it now. As always, it is in layers of ambiguity that Bowland’s work thrives. Existing in an unknown time and place, her subjects are caught in the crosshairs, but each emerges triumphantly, ultimately stronger for having endured. Bowland’s spellbinding and psychologically charged work brings viewers face to face with contentious culture while affirming the resilience and triumph of the human spirit. A masterful observer of life’s unpredictable nature, her work conveys universal themes through unusually specific insights. Bowland’s work explores the subtle and nuanced edges between strength and vulnerability, certainty and doubt, faith and disbelief. 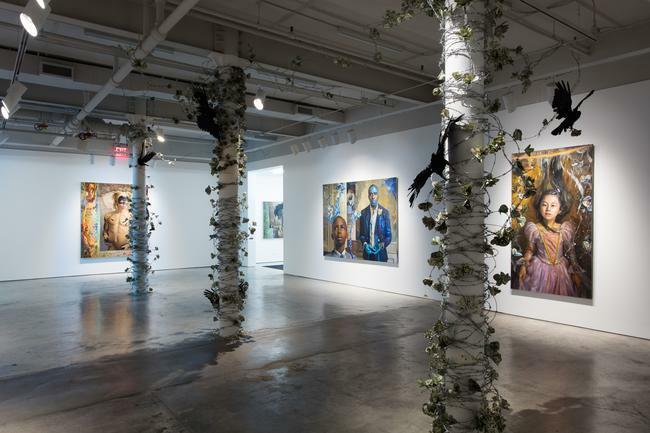 Her paintings and pastels draw upon legendary American novelist and social critic, James Baldwin’s, rallying cry that “Artists are here to disturb the peace.” Bowland’s probing and deeply personal images call into question our societal expectations of gender, race, and beauty. 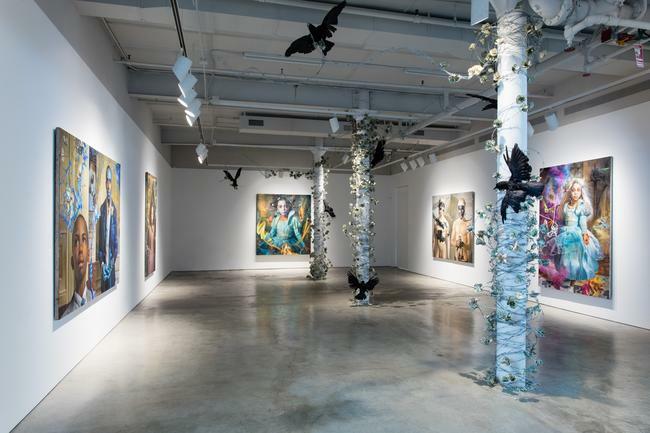 Margaret Bowland has been exclusively represented by Driscoll Babcock Galleries since 2011. That same year the gallery presented her first New York solo exhibition, Excerpts from the Great American Songbook, which traveled to the Greenville County Museum of Art, South Carolina. Bowland’s second solo exhibition, Disturbing the Peace, was presented in 2013. Bowland’s work has been shown nationwide and internationally in group exhibitions, including Peter Tatistcheff Gallery, New York, NY; Alan Avery Gallery, Atlanta, GA; Orange County Center for Contemporary Art, Orange County, CA; and Art Fair 21, Cologne, Germany. Additionally, in 2009 she received major recognition as the People’s Choice Award Winner in the Outwin Boochever Portrait Competition at the Smithsonian National Portrait Gallery in Washington, D.C.